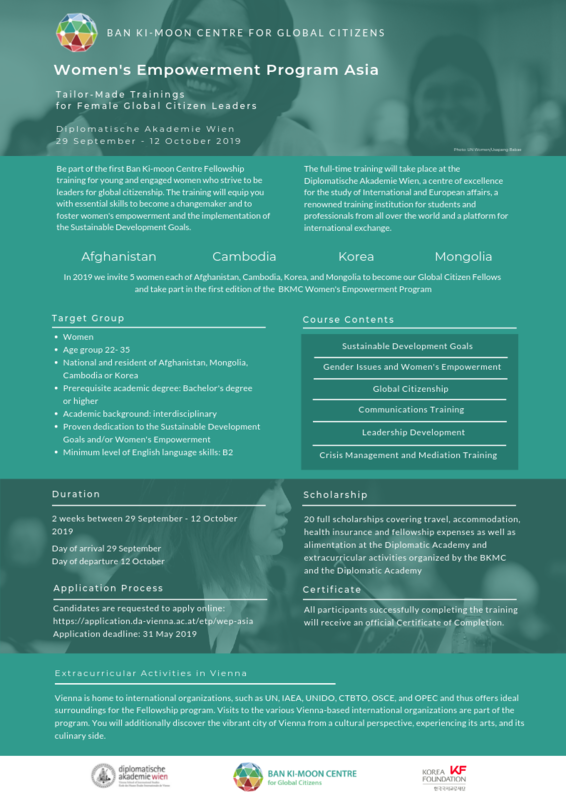 The BKMC Women’s Empowerment Programs offer a unique opportunity to advance young international female global citizens’ potential to promote the Sustainable Development Goals and foster women’s empowerment in their countries of origin by training their communication skills, crisis management and mediation competencies at the Diplomatic Academy of Vienna, a centre of excellence for the studies of international affairs. Our full-time trainings offer an environment in which young women can refine their ability to make sustainable change and grow their networks to become the leaders of tomorrow. Thanks to our partners, the expenses of our trainings are fully covered and we can offer our participants an unforgettable experience in the heart of Europe, where historic international agreements were negotiated that lay the basis for the international system as we know it today. The regional focuses intend to create regional alumni networks that will connect the participants even after the trainings have been concluded. Such networks of future female decision-makers seek to strengthen the international relations among the regions to facilitate sustainble international cooperation for today’s and future generations. Information about the Women’s Empowerment Program targeting young women from the Gulf Cooperation Council Member States will be provided soon. Applications will be open in April. Stay tuned and follow us on twitter and facebook for updates! Any questions about the application process for the Women’s Empowerment Programs? Please contact our counterparts at the Diplomatic Academy of Vienna Ms Petra Kakuska petra.kakuska@da-vienna.ac.at.